BELTON, Texas – For the third straight season and fourth time in six years since moving into Crusader Stadium, the University of Mary Hardin-Baylor football team will play a home game in the NCAA Division III National Semifinals. The Cru will host Wisconsin-Whitewater at 2:30 pm this Saturday with a berth in the Stagg Bowl on the line. UMHB improved to 13-0 and advanced to the Semifinals for the eighth time in program history with a 21-18 victory over Saint John's on Saturday. Wisconsin-Whitewater moved on and improved to 12-0 on the year with a 26-12 win over Bethel University last weekend. The Cru and Warhawks will be meeting in the Semifinals for the fourth time and Saturday's game will be the sixth overall meeting between the two programs. Wisconsin-Whitewater has won each of the previous five meetings, including a 16-15 victory over the Cru in the 2013 Semifinals at Crusader Stadium in the last meeting. UMHB has a 39-15 all-time record in the NCAA Division III National Championships and joins Mount Union as the only two Division III programs in the country to win at least one playoff game in each of the last 15 seasons. Wisconsin-Whitewater has won six National Championships and is 52-9 all-time in the NCAA Division III National Championships. The winner of the UMHB/Wisconsin-Whitewater game will advance to play the winner of the Mount Union/Johns Hopkins Semifinal in Stagg Bowl XLVI in Shenandoah, Texas on December 14th. The game will be broadcast on K101.7 FM with the pre-game show starting at 2 pm on Saturday. ESPN3 will stream the game and that broadcast will also be available on the ESPN app. Live statistics for Saturday's contest will be available through ncaa.com. Tickets for Saturday's playoff game will go on sale to previous season ticket holders on Tuesday, December 4th. Ticket sales to previous ticket holders will remain open through Wednesday before going on sale to the general public on Thursday, December 6th. Tickets not claimed by season ticket holders will be released to the general public Thursday morning. The ticket windows at Crusader Stadium will be open from 11 am to 6 pm each day from Tuesday through Thursday. The ticket office will be open from 9 am to 1 pm on Friday, December 7th. Online ticket sales will open on Thursday. Advance tickets are $10 for reserved seats, $8 for general admission and $4 for students. On Saturday, reserved seats will cost $12, general admission will be $10 and student tickets are $4. The ticket windows will open at 12:30 pm on Saturday. Well, they've never beaten Whitewater. But that was under their former coach. They hadn't ever beaten Linfield until they beat Linfield in 2016...twice. Potential to be a real sloppy game. 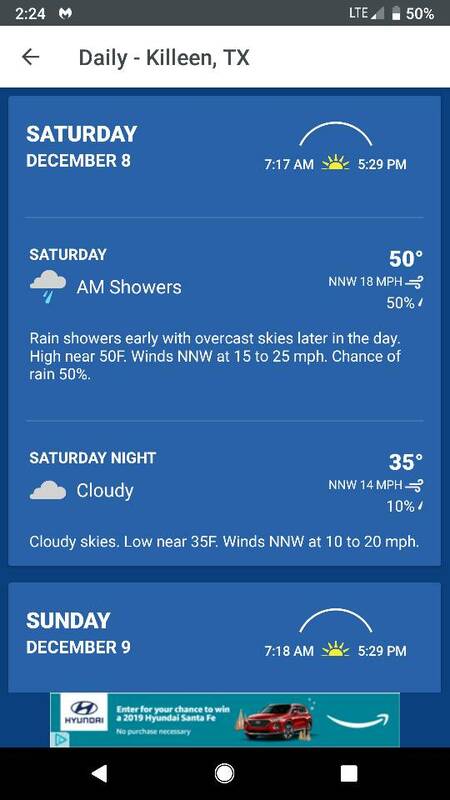 Supposed to get 2 inches of rain Friday and Saturday's temps will only be 50 for the high. Not much drying under those conditions. Good luck UMHB, nice for a local school to do well. If this forecast holds, it'll be good news since it's a 2:30 start. Whitewater is used to crappy weather in Nov and Dec. The rain has cleared. It'll be chilly in the stands, but hopefully, not a factor for the game. team and then #3 St. John's? All the other semi-finalists had a much easier road. Last edited by CenTexDave; December 8th, 2018 at 10:22 AM. Ya, that guy is a moron. The Crusaders have had a ranked team every week of the playoffs with an average ranking of 10, and averaged 41 points, while Mount Union played an unranked, 25th, and 24th ranked teams and averaged 49 points per game. Whitewater played two unranked and an 11th ranked team and averaged 49 points. I hope this lack of respect fires up the Cru! I saw this on Harmon's Twitter feed today. Nice input by Steven Thrash. The Cru's one loss? Last year's Stagg Bowl to Mt. Union. Mt. Union's one loss? To the Cru is the 2016 semis.